Can Cats Eat Cheese? Is Cheese Safe For Cats? 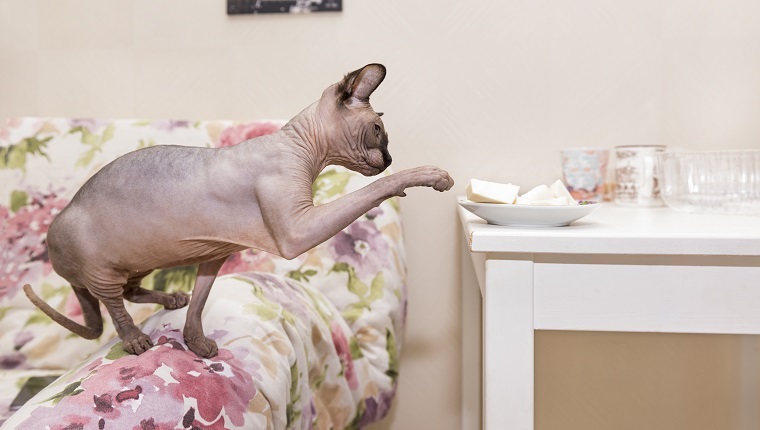 “Can cats eat cheese?” You probably ask this if your cat sneaks some cheese off the table, if you want to share a snack with your kitty, or if you try to slip your cat a pill in a chunk of cheddar. Most humans can eat cheese, so is cheese safe for cats, too? The answer to that question is technically yes, most cats can safely eat small, infrequent servings of cheese. However, there are many exceptions, so it is very important that you consult your veterinarian before sharing cheese–or any human foods–with your cat. Some kinds of cheese are safer than others for felines, and too much cheese can make your cat very ill. At best, cheese is unnecessary for your cat, and you should avoid feeding it to them if possible. Some cats should not eat cheese at all, and many other human foods can be better, safer choices to share with your cat. Here is what you should know about feeding cheese to cats. When Is Cheese Bad For Cats? It is important to realize that cheese is not a natural part of a cat’s diet. While cheese contains fat and protein–which cats need–a healthy, mostly-meat-based diet will already fulfill your cat’s nutritional requirements, so they certainly don’t ever need cheese. The potential risks of feeding your cat cheese almost always outweigh any benefits it might provide to them. Cheese that comes from cow’s milk contains lactose, and most cats are lactose intolerant to some degree. Some are more lactose intolerant than others. At most, cats should only eat small pieces of cheese once in a long while. Although it may not be toxic or cause immediate sickness in your cat, too much cheese can lead to severe complications. 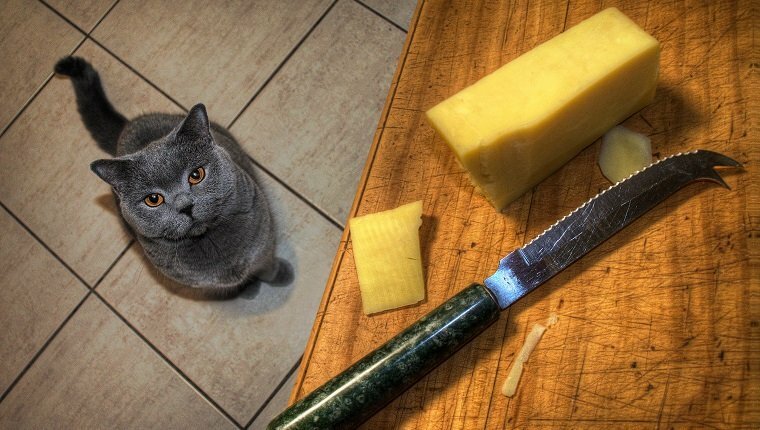 Here are a few ways cheese can be bad for cats. Lactose intolerance. Most cats are lactose intolerant on some level, but you may not know how lactose intolerant your cat is until you feed them a dairy product. If your vet says it’s okay to give your cat a piece of cheese, start with a very small piece and see how your cat reacts. If they get sick, do not feed them any more dairy products. Cats that are lactose intolerant may suffer from upset stomach, diarrhea, vomiting, or other gastrointestinal issues if they eat cheese. High fat content. Cheese is quite high in fat, and too much can lead to health problems in cats, just like humans. Cats that eat too much fat can suffer from obesity, heart disease, diabetes, and other complications. High salt content. Many types of cheese are high in salt, and too much salt can cause increased thirst and abnormal urination. Too much salt over a long time can lead to hypertension, kidney problems, and more health issues. Other ingredients. Some kinds of salt come with garlic, spices, and other flavor additives that can be toxic to your cat. Do not feed them cheese with any additives. When Is It Safe To Give Cats Cheese? For cats that are highly lactose intolerant, cats that have medical conditions that require restricted salt or fat intake, or cats that are very young, cheese may never be a safe option. You must ask your veterinarian before giving your cat any cheese. However, for healthy cats that are not particularly lactose intolerant, it may be safe to share small bits of cheese with them very infrequently–probably a handful of times a year, at most. A bit of cheese can be helpful if you need to get your cat to take a pill and want to hide it in something tasty so they actually eat it. However, if your cat needs regular medication on a daily basis over a long period of time, cheese is not the best option and can make them quite sick. The same goes for sharing a treat with a hungry kitty. If your fur baby is giving you the cute kitten eyes and begging you for a taste of your cheese stick, they will be better off if you resist and offer them another treat, instead. Some cheeses are safer than others. Cheeses that are low in salt content and low in lactose are usually less harmful to cats. Swiss, cheddar, and Parmesan are better choices than many other types of cheese. Softer cheeses tend to have more lactose and should be avoided. 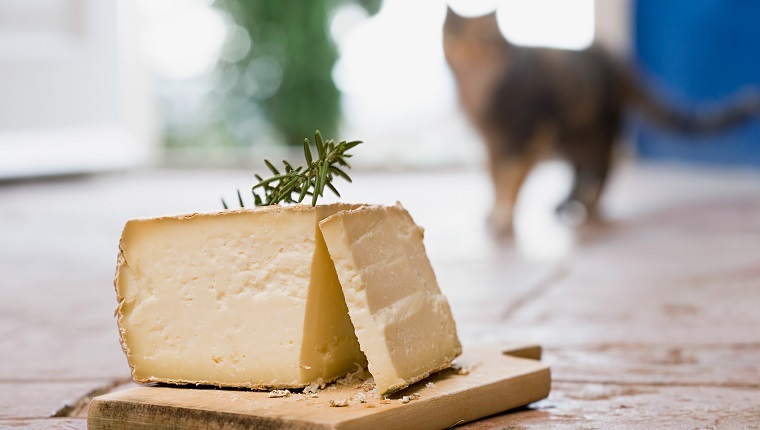 Goat’s milk cheese may be better for some cats, so long as it is pasteurized. Other options that may be better for cats include cheese made from almond milk, hemp, or soy, but these choices have different amounts of fat and protein that you must take into account. You should ask your vet before giving your cat any of these kinds of cheeses. What Can I Give My Cat Instead Of Cheese? 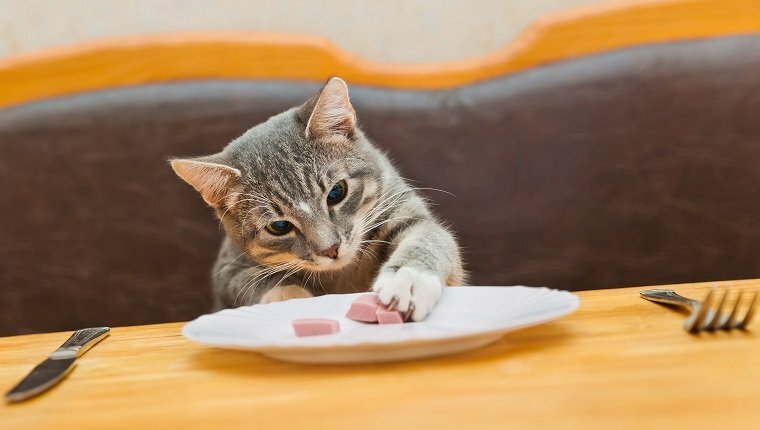 If you want to share your human food with your cat, or if you want a safer treat to slip them medication, there are plenty of options. Again, you must ask your vet before sharing these foods with felines and take your cat’s overall nutritional needs into consideration. If they have a strict diet, you’ll need to be careful. Also, keep in mind that these foods should be served to your cat plain. Extra spices, salt, sauces, or flavoring could be toxic to your cat. With all of that in mind, here are a few foods that can make safer treats for kitties than cheese. Do you ever feed your cat cheese? What are some other healthier treats that you feed your cat? Let us know in the comments below!